Lin Dunn served as Head Coach of the Women's Basketball program from 1978-87, where she accumulated a 149-119 record with the Hurricanes. During her nine seasons in Coral Gables, Lin guided the Hurricanes to their first-ever ranking in the Associated Press Top 20 in 1985 and to its first Florida State Championship in 1981. 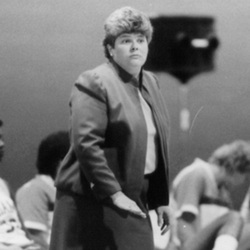 She was the 1981 Florida Coach of the Year and served with the 1986 United States Women's Basketball Team in 1986. Lin served as President of the Women's Basketball Coaches Association in 1984-85. Prior to her arrival in Miami, Lin served as the head coach at Mississippi (1977-78) and Austin Peay State (1970-76). Her first year saw UM finish 10-13 and place fifth in the state. The team rebounded largely in her second season posting an 18-16 record. Lin's impact became apparent in her third season with Miami (1980-81), as the Hurricanes forged a 24-15 record. From there, the record-setting team made its first postseason appearance in the AIAW Region III Championship. Her 1981-82 squad followed up on its previous seasons' success with a 19-10 record, and another berth into the AIAW postseason tournament. Dunn's seventh season resulted in her top win percentage (.750) 21-7. Following her time spent at the University of Miami, Lin would later coach in the ABL with the Portland Power and in the WNBA with the Seattle Storm. Among the record-holding players Lin has coached at Miami were Maria Rivera, Robin Harmony, Cordelia Fulmore, Sylvia Wilson, Donna Mapp, Joani Bowles, Wendy Foote, Jill Poorman, Elaine Harlow and Lorretta Harvey. Lin Dunn was inducted into the Women's Basketball Hall of Fame in 2014.